wonderful views over Kalkan & the Bay. spiral staircases to the main bedrooms. 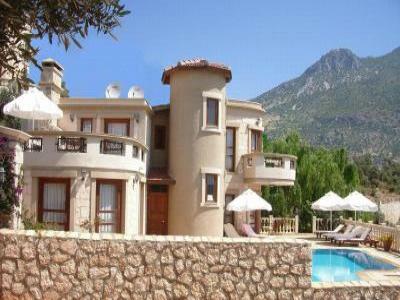 doors which open onto the large terrace and private swimming pool. machine and ample ancillary kitchen items. ensuite bath/shower room and direct access to the terrace. shopkeepers and their hospitality offering of apple tea. even the most discerning palette. turquoise sea, sunbathe, enjoy the food, all at unbelievable value. snorkeling, scuba diving and wind surfing. the Taurus mountains or the amazing Saklikent Gorge. Villa utilities and services as described. towels changed twice weekly. (beach & sun towels are not provided). Free transfer from Asfiya to the Yaly Beach Club. million Turkish Lira for credit only. personal accident and liability insurance. is due and required eight weeks prior to the departure date. within 6 hour air flight from England.